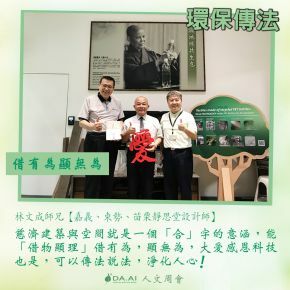 The Industrial Design Excellence Awards (IDEA) from USA, Red Dot Design Award, and iF Design Award from Germany stand as world’s top three famous design awards that recognize and promote talented design work and trustworthy brands. 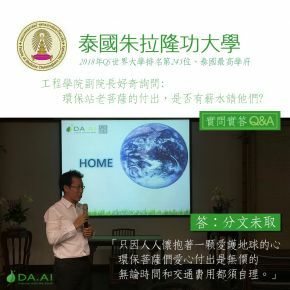 Over past few years, DA.AI has been recognized by these awards, showing how design experts see the true value behind DA.AI eco products and dedications. 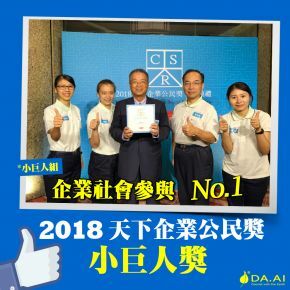 DA.AI first applied IDEA with its signature R2R technology in 2017 and was honored as a Finalist. 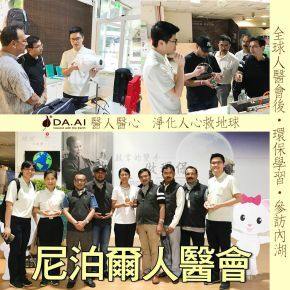 This year, DA.AI’s Heart Purification APP and ITRI Light Code knocked the competition door again and hoping for a better result once announced on Sept. 20th. 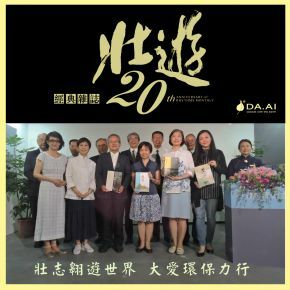 Each year, more than 1,600 entries are submitted, making IDEA one of the largest and most desirably anticipated design awards. 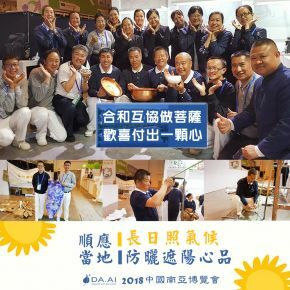 IDEA 2018 jury Michael Kahwajisenior, design manager of Whirlpool Corp., expressed that IDEA is "one of the world's most prestigious and rigorous design competitions that is moving into its 38th year—revitalized and energized." 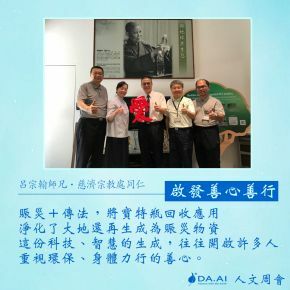 DA.AI has obtained both Red Dot with Heart Purification APP and ITRI Light Code & Compassion Technology Series (Eco Puncture-proof Casual Shoes), and iF Award with its Compassion Technology Series (Eco Puncture-proof Casual Shoes) from Germany, and we certainly wish to hear good news soon in coming September. 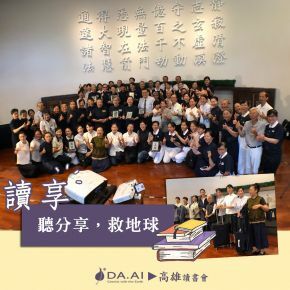 Since establishment on December 10th, 2008, DA.AI has given over 3,000 eco public sharing. 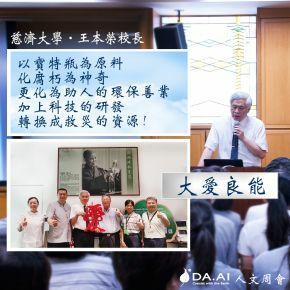 On June 12th, 2018, a visit of 16 international students from the Business School of National Cheng-Chi University was added to the list. 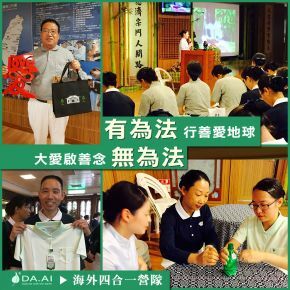 These students were interested in Taiwanese corporate ethics and corporate social responsibility (CSR). 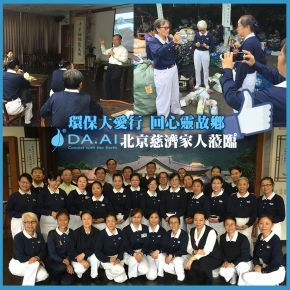 Professor Shi Ging Liu together with DA.AI staff, Tom Yang, demonstrated how a non-profit organization is built, managed, and transformed recycling experience into daily implementation. 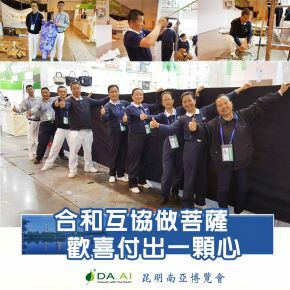 DA.AI Technology always welcomes opportunity to promote environmental protection and shares its latest eco implementation. 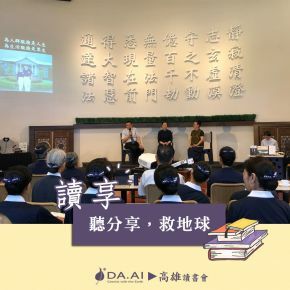 Through video and talk, Tom introduced how and why DA.AI wants to invent its eco-friendly product series, such as the Puncture-Proof Shoes, Solar LED Cap, and other disaster-relief outfits from the Compass Technology Series and Pressure Fabric Series. 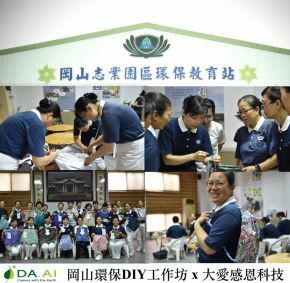 Most of these products protect the safety or health of Tzu Chi volunteers while servicing in the front line. 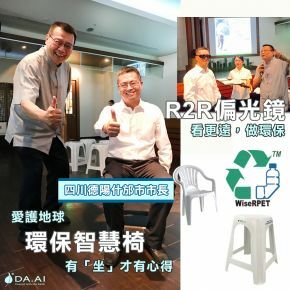 Tom also asked students to try out the DA.AI WiseRPET plastic chairs, made from modified recycled PET material, which students felt comfortable and ergonomic. 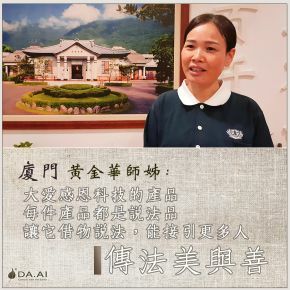 Professor Shi-Ging Liu said, “Business School of National Cheng-Chi University focuses on corporate ethics and CSR education, and we see that DA.AI is a real social enterprise that contribute to society with its innovative products that solve many social problems.” Senior student You-Rong Lin shared, “this class named ‘Social Leadership and Innovation’ aims to explore social groups that help society with innovative invention. 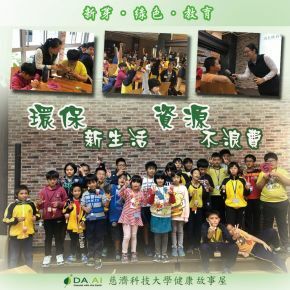 I do feel DA.AI’s concept is worth learning.” Working with the Government, the industry, and academic circles, DA.AI has aggressively devoted itself to share experience and promote concept of eco education, which not only build a good relationship with the community, but also save Earth. 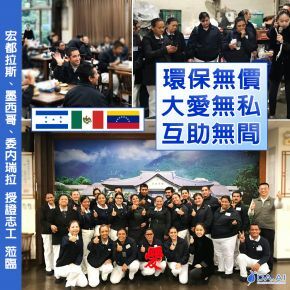 On June 14th, 2018, nearly 300 volunteers attended Tzu Chi’s Four-in-One Global Retreat at the Tzu Chi Eastern Chapter to deepen their understanding of Tzu Chi’s missions. 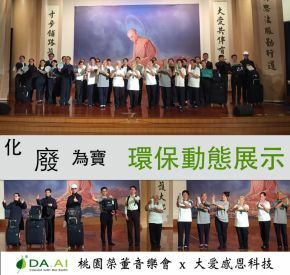 Two environmental protection lessons were given in the afternoon, where DA.AI staffs, Irene Lin and Hsu-Pin Chang, shared “Tangible Business Law vs. Intangible Dharma Spirit” and “Eco Education” topics. 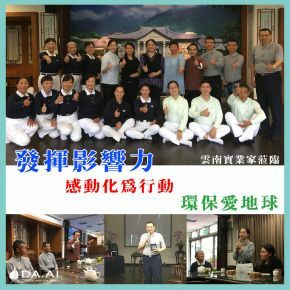 Volunteer from Don Guan, China, said, “we benefit greatly from the enriched eco training contents and spiritual sharing” after the lessons. 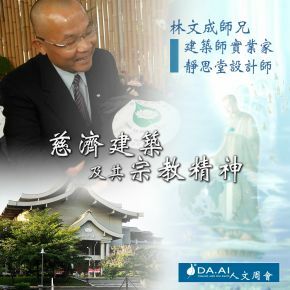 DA.AI identified itself as a "spiritual transformation factory," since ordinary companies pursue Return of Investment (ROI), while DA.AI pursues Return of Influence. 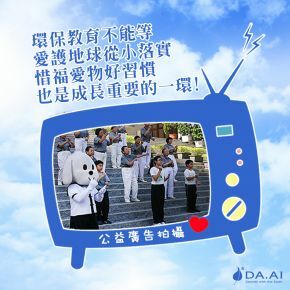 With the aim to inspire every volunteer to learn from different role model and implement environmental protection and charity in every community, DA.AI brings light to dark corners around the world and protects Mother Earth. 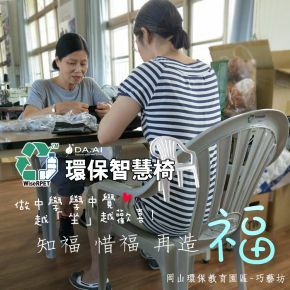 In response to environmental sustainability, DA.AI seeks to provide eco lifestyle outfits and accessories made from recycled PET bottle as consumer’s alternative choices. 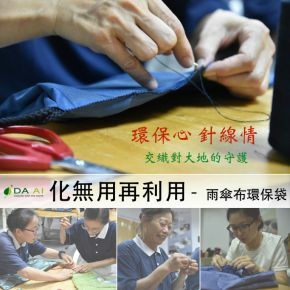 Over past decade, DA.AI spreads the “eco-replacement for daily necessities” and “80/20 ratio” ideologies, meaning if you demand 10 pieces of products, let 2 pieces to be from eco-friendly material, since each of our choice and action will affect resource consumption. 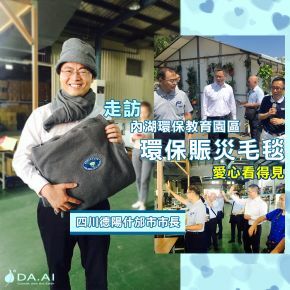 DA.AI Eco Cultivation Multifunctional Bag meets the rigorous EU standard of non PFOS eco-friendly water repellent fabric, not only functional for consumers, but also friendly to our environment. 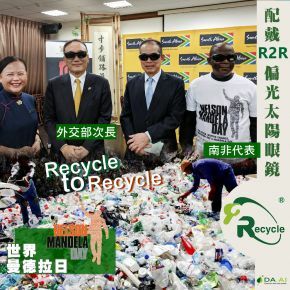 The side recycled bottle logo shows the environmental bodhisattvas’ dedication in making this bag possible. 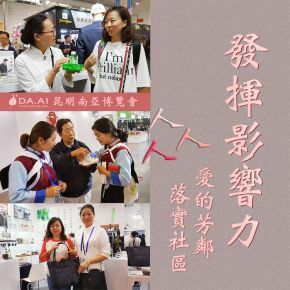 Each bag carries the love and warmth from environmental bodhisattvas and comes with a unique production history documenting this love. 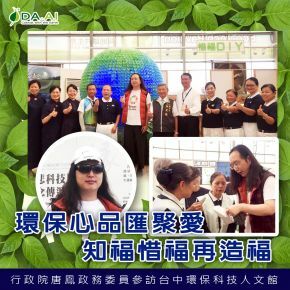 Not to encourage buying demand, but to educate the difference between need and desire by showing all the environmental protection information. 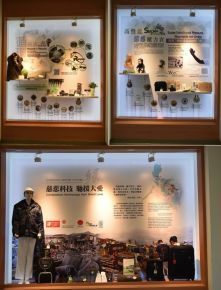 The Eco Cultivation Multifunctional Bag fits A4 size document with large compartment. Enhanced carrying straps reduces shoulder pressure and widen bottom for better balance. 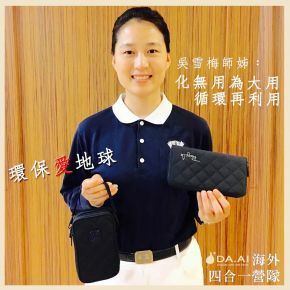 Two zipper side compartments not only avoid accidental dropping out of little accessories, but also great for umbrella, cell phone, etc. 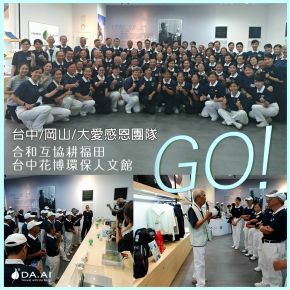 which is perfect for Tzu Chi volunteers and consumers’ casual daily activities. 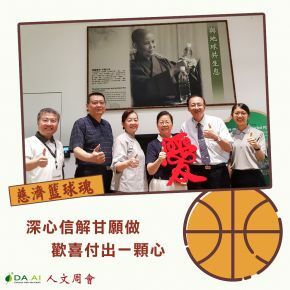 This newly developed bag reflects Tzu Chi’s simplicity and elegant image as well as the importance to protect our environment. 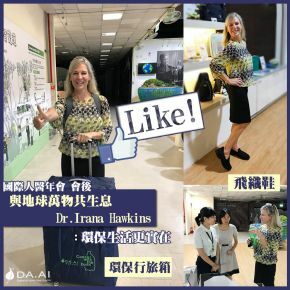 B Corp index data is compiled from over 1,750 businesses using the B Impact Assessment standard by B Labs, an US non-profit authority that provides credible social enterprise certification – the B Corporations. 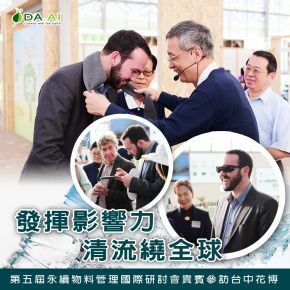 B Impact Assessment is the most widely used tool to assess a company overall positive social and environmental impact in diverse fields, including governance, workers, community, and environment. 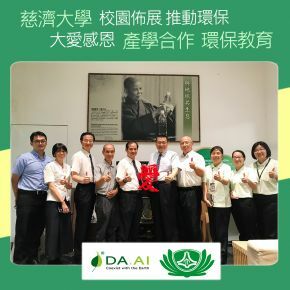 DA.AI has been a B Corp certified company since 2016, using the power of business to solve social problems, and was highly ranked in the community category. 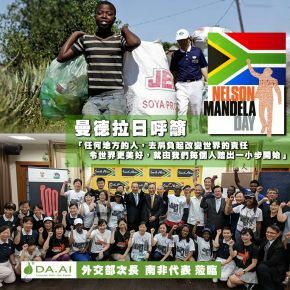 2018 Best for the World in community measures the company’s practices and policies around community service and charitable giving. 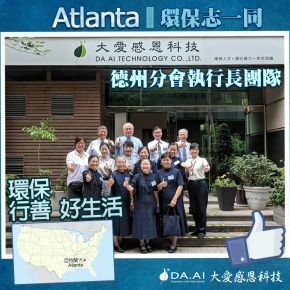 DA.AI’s products are designed to solve environmental problems and its corporate spirit is to bring this “eco power” to purify people’s mindset and harmonize the society. 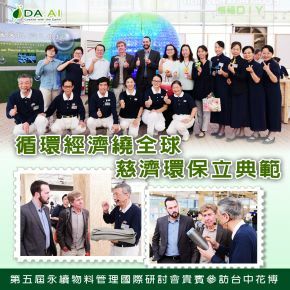 DA.AI is not only an eco-promoter, but also an eco-implementer. 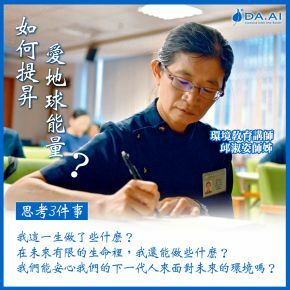 Usual company pursues ROI as return of investment; however, DA.AI’s ROI is pursuing “return of influence” and influence the world with this humanitarian force. 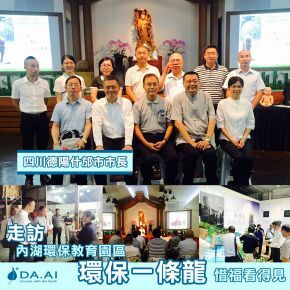 DA.AI held a Tea Ceremony on May 11th to thank Kaohsiung environmental bodhisattvas for their daily eco-friendly dedications. 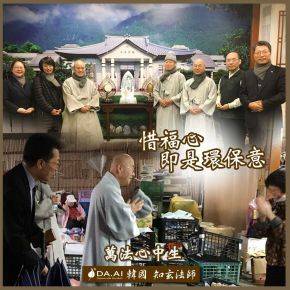 In addition to a series of group interaction activities and sign language performance, DA.AI also donated the latest WiseRPET plastic chairs to provide elderly bodhisattvas a more comfortable environment while doing recycling work. 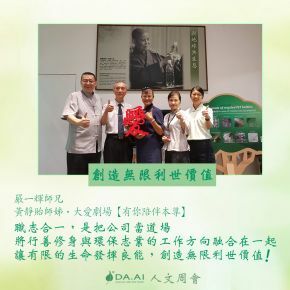 DA.AI General Manager, James Lee, gave his thanks to Kaohsiung environmental bodhisattvas, “thanks to your selfless devotion to the global environment, seeing the efforts of the elderly bodhisattvas, DA.AI will continue to develop more useful, practical, and durable eco-friendly products.” The WiseRPET plastic chairs are made from modified materials by DA.AI’s R&D team, different from traditional plastic chairs, they are more durable, comfortable, and ergonomic. 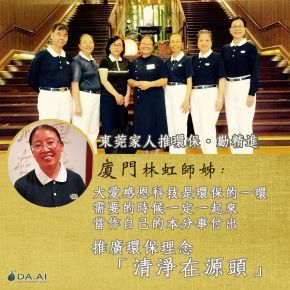 DA.AI’s R&D department staff, Dr. Lori Chen, shared the newly developed WiseRPET chips with the environmental bodhisattva, which will further develop into product series/device that protects Tzu Chi volunteers’ health. 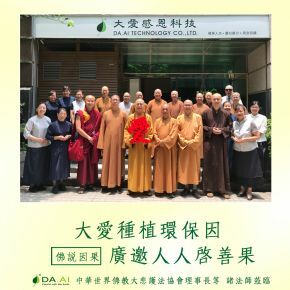 Jing Si Aphorism states that “we should acknowledge, cherish, and cultivate our blessings,” and that we should always put eco-concept into practice. 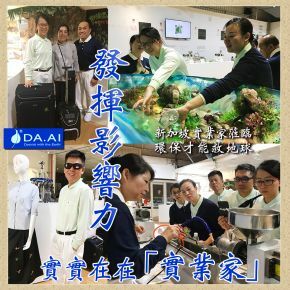 DA.AI’s R&D and design team always try to put environmental bodhisattva’s story and effort into product development and design. 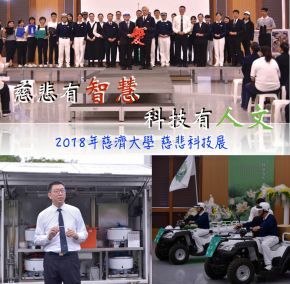 Through design concept and eco product, we wish to better communicate Tzu Chi’s humanitarianism and eco spirit to everyone and create the circle of kindness in the world.